On February 20, 2014, pursuant to the Violence Against Women Reauthorization Act of 2013 (VAWA 2013), the Pascua Yaqui Tribe was one of only three Tribes across the United States to begin exercising Special Domestic Violence Criminal Jurisdiction (SDVCJ) over non-Indian perpetrators of domestic violence. Since that time, the Tribe has had 20 reported cases involving non-Indian defendants. On July 2, 2014, for the first time since 1978 when the U.S. Supreme Court stripped tribal governments of their criminal authority over non-Indians in Oliphant v. Suquamish Indian Tribe (1978), our tribe obtained the first conviction of a non-Indian, a twenty-six year old Hispanic male, for the crime of domestic violence assault committed on the Pascua Yaqui Reservation. Throughout this process, the Pascua Yaqui Tribe has actively engaged in a process of sharing information with other tribes who are exercising (or considering exercising) powers restored under the Tribal Law and Order Act of 2010 and the Violence Against Women Act of 2013. Urbina, Alfred and Melissa Tatum. 2014. 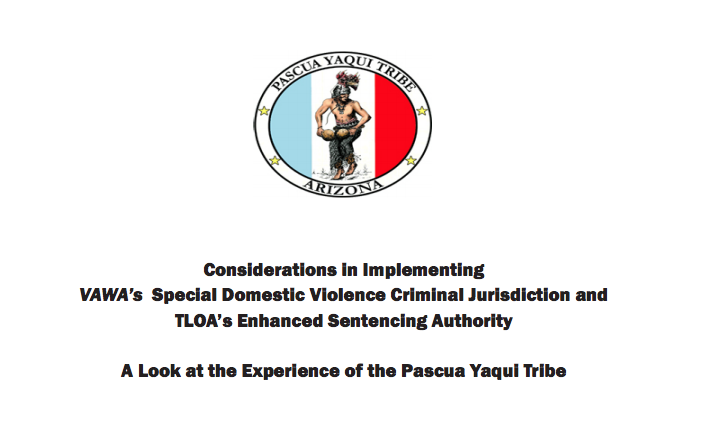 Considerations in Implementing VAWA’s Special Domestic Violence Criminal Jurisdiction and TLOA’s Enhanced Sentencing Authority: A Look at the Experience of the Pascua Yaqui Tribe. Tucson, AZ: Pascua Yaqui Tribe. (http://www.ncai.org/tribal-vawa/getting-started/Practical_Guide_to_Imple..., accessed January 28, 2015).